Capt. 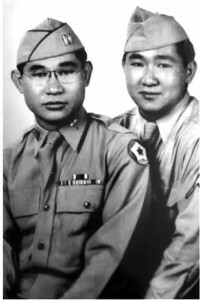 Seiya Ohata (left) and Hiroshi “Harold” Ohata, a younger brother who served in the Occupation of Germany. Another younger brother, Dr. Yasushi “Roy” Ohata, served in the Korean War in the Dental Corps. ‘I was born in the town of Lahaina, Maui, spent my childhood in Paia, now known as the windsurfing capital of the world, attended Maui High School, the University of Dayton, Ohio, and received my medical degree from the University of Missouri, St. Louis, Missouri. “When the war started on Dec. 7, 1941, I was a senior medical student. Those were very tough times. I was thoroughly investigated by the FBI because of the status of my father, a physician and a leader in the Japanese community on Maui. When World War II broke out, he was immediately detained and all of his assets were frozen. I needed financial aid desperately, so I went to the Army recruiting office to enlist. I was rejected repeatedly but was accepted in March 1943, when I received my medical degree and was commissioned as a First Lieutenant. “Following training and duty at various camps, I was assigned to the 165th field hospital, Camp Grant, Ill., for deployment to Europe. We left New Jersey in the spring of 1944 — the convoy zigged-zagged their way through the Northern Atlantic to avoid the German U-boats. Finally, in about two weeks, we arrived in England. D-Day started on June 6, when Gen. Eisenhower unleashed the mightiest onslaught imaginable and the Allies invaded Normandy. We waited and when the Allies established a beach-head, we were ordered to proceed. I think it was around midnight on June 7 when our landing craft brought us to the shores of Omaha Beach in Normandy. The tide was low and the landing craft could only go so much — we had about 50 yards to go — it seemed like a mile. We had to wade in. My comrades were six-footers — the water came up to their knees so it was not a problem, but being only five foot, the water came up to my waist! I had to carry my backpack over my head — it was very difficult. We finally arrived in the wee hours on June 8. “The Army Corps of Engineers did a superb job of setting up the tents and buildings of our field hospital in the outskirts of Cherbourg in Normandy. It was a heart-wrenching site to see the severe destruction of the area. I remember the little village of Saint Lo — it was totally demolished — not one building was standing. The casualties were high, and we worked caring for the wounded. Then came the Battle of the Bulge. The Battle was fierce — the casualties high. In early spring of 1945, I received orders to be transferred to Collecting Company 8, a medical unit attached to the 286th Infantry Regiment, 97th Infantry Division of Patton’s 3rd Army. We were on the outskirts of Pilsen, Czechoslovakia, awaiting orders to attack. Instead, we received orders to cease fire! The war was over! “Soon we were on our way home. As our troop ship neared the United States, we saw the Statue of Liberty — what a sight that was — our Company Commander announced, “Good news! You will all get 30 days’ leave — visit your loved ones, your family and friends. Return to Fort Bragg, North Carolina, for regrouping, then we will proceed on to the Asiatic Theatre to fight Japan!” Then he added, “Except Lt. Ohata because no one goes from the zone of interior (Z1) (continental U.S.) to the combat zone (Hawaii) for a vacation. “But it is my home,” I cried. To make a long story short, I was given a telephone number in Washington, D.C., to explain my plight. I called, and the officer whom I talked to also said he never heard of anyone going from the Z1 to the combat zone for a vacation period. Success! I was granted permission to go to Hawaii. “So, off to the nearest Army airfield I went. I arrived at Hickam — still had a short flight to Maui. When I arrived on Maui, a captain in his Jeep gave me a ride and took me right to the doorsteps of my home. When I knocked on the door, my mother burst into tears. Tears of joy! My mother was a very stoic person. This was the first time that I saw her cry.